For readers who are new to this blog, I wrote this post to correct misinformation about the destruction of cultural property, because such misinformation worsens community relations and thereby endangers lives. For activists from any community, no, I will not become your mouthpiece. I work on trafficking and I am returning to that work. I should also point out that I did not look for the comments that I have included in this post. Looking for information about the vandalism, in order to document the crime against the Assyrian community, I found comments on the vandalism. Especially due to the false information, I judged that the comments were important, as they demonstrated the impact of misinformation on community relations. I absolutely recognise that there are nationalist and aggressive Kurds, as there are nationalist and aggressive individuals and groups within every community. The comments that are discussed here are reactions to a specific incident; they are not representative of any community (beyond the nationalist community). Nonetheless, they are genuine evidence of harm from misinformation about cultural property crime. Due to the complaints and accusations, I ran the searches again. It was a limited but nonetheless scientific sample. I searched for “Kurdish” or “Kurd(s)” and “Assyrian(s)” on Twitter and “Kurds”, “Assyrians”, “flag” and “Iraq” in Google since the news broke. The searches are reproducible and the findings are checkable. 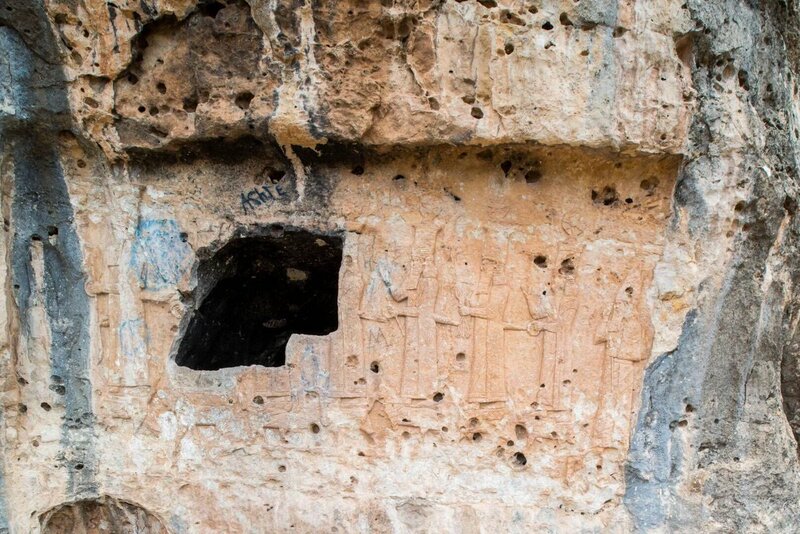 As further evidence of the problem with misinformation, despite the expert testimony of an archaeologist who knows the site and who has explained that the “bullet holes” are natural holes, “Assyria” (@KingSargon26) opined, ‘loool “it [the paint] can be washed off” what a joke.. what about the bullets holes can they be filled up?’ Much like harm to cultural property, harm to community relations can never be completely undone. I don’t know who or what his sources were. And I don’t know what “deliberate damage” was supposed to include. But Associated Press reporter Sinan Salaheddin relayed apparent evidence of ‘[d]eliberate damage to [the] ruins of [the] Assyrian city Khenis[/Khinnis] in #Iraq’s #KRG. It was built around 700 BC by King Sennacherib.’ He did not repost the “before” image or repeat the claims about target practice that I fact-check here. The UK Consul General to the Kurdistan Region and Northern Iraq, Angus McKee, shared a photo of tomb art at Qizqapan/Qyzqapan/Seríserd, which he presented as a symbol of reconciliation. When she saw spray-painting on it, Kurdish Syrian archaeologist Hellen Almoustafa commented that they ‘should be more aware about vandalism and graffiti’. Even though Hellen was civil and concerned, the reaction was immediately insulting. “Assyrian” (@ashooretah) categorised Kurds as aggressive ‘occupiers’ and offered empty sympathy that Kurds had ‘no history’. 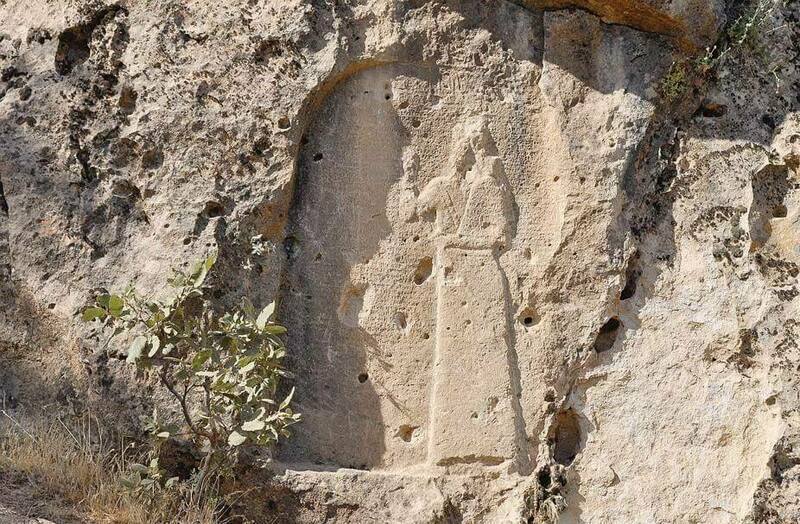 Freelance photographer Adam Mirani replied by sharing a photo, which apparently showed that the ‘Maltai Assyrian relief in Duhok [had] recently [been] vandalized as well’. Adam Mirani’s photograph was republished by the Assyrian International News Agency (AINA), which noted that, in 2006, ‘a team from the Iraq Sustainable Democracy Project [ISDP] visited the site and reported that it had been used for target practice by Kurdish soldiers’. As AINA’s original report explained, the ISDP was ‘a special project launched by the [international but] Chicago-based Assyrians [sic – Assyrian] Academic Society’, and it had ‘noted bullet holes, indicating that the reliefs have been used for target practice‘. The Chair of Iraq’s State Board of Antiquities and Heritage (SBAH) and member of the Board of Advisers of the Assyrian Academic Society, Donny George Youkhanna, judged that local development works had not damaged the sculptures. Comparing the photos of the site with his memories of the site, George judged that ‘there must have been some new shooting, because there [had] been new chipping on the sculpture’. Occupied Assyria repeated, ‘Kurds vandalize Assyrian heritage in Nohadra (Dohuk) by painting a Kurdish flag on ancient reliefs after using it for target practice’. Unfortunately, there and elsewhere, the apparent evidence brought out the nationalism and bigotry that one might expect and fear. The discussion may have been particularly bitter because some people believed that the large hole was the product of a violent attack. Some people, such as Huaida, claimed to show photos of ‘Before and after kurdish militia barbarian actions against Assyrian relief in Nohadra (Duhok)’. 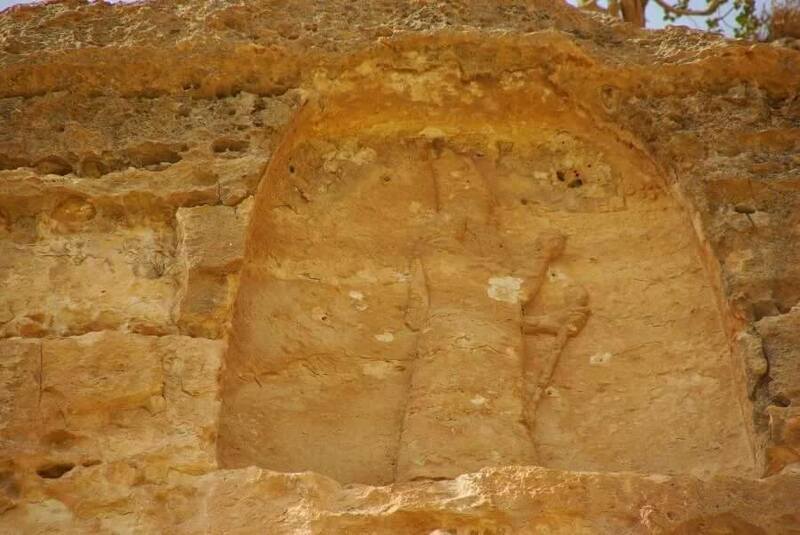 The “rectangular-framed” carvings are at Maltai, where they depict king Sennacherib venerating Assyrian gods. 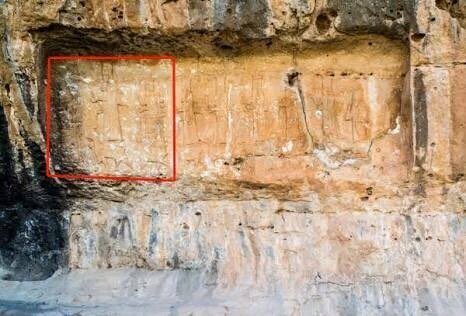 Simone identified the “arch-framed” carvings as ones at nearby, but separate, Bavian/Bawian; they have also been damaged by ancient tombs, natural holes that look like bullet holes, and graffiti. 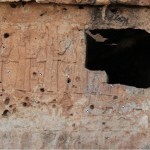 The large holes were not the products of violent attacks or ignorant military training exercises. As Simone Muehl explained to me in a message (and as Zainab Bahrani had recorded on Archmap), in the first to third centuries C.E., the local community cut through two panels to make tombs. 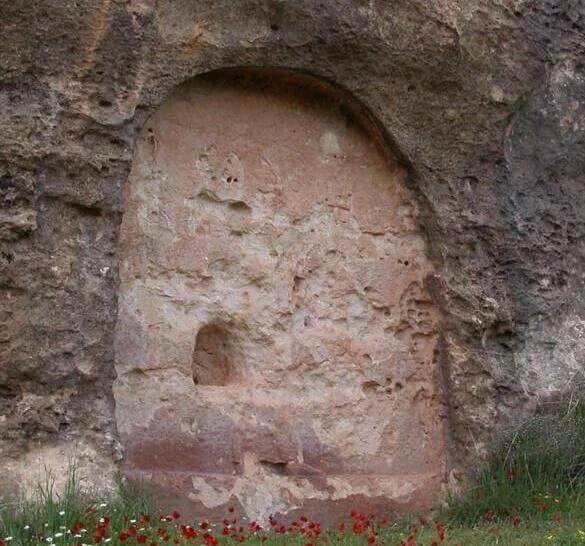 The larger, finished tomb is the hole in these photos. Looter-dealers cut out part of a third panel (in the 1920s? ); part of the third figure in the third panel is now in the National Museum in Baghdad. Furthermore, the “before” image shows a completely different carving. (The carving of the “frame” is different; the figures in the frame are different; the weathering and staining of the stone is different…) Huaida had lifted the “before” image from Christopher Jones on the Gates of Nineveh, who had got it (with permission and understanding) from Paolo Brusasco on the Iraq Crisis listserv. The flag was painted on the wall, but the other claims are false (or misrepresented). They are being used to fuel violent nationalism and must stop. Wait so at the end of the day Kurds (whether sanctioned by the KRG or not, painted and vandalized an ancient Assyrian site-target practice aside. This latest issue deals with the flag, which is what has brought the issue to fore. 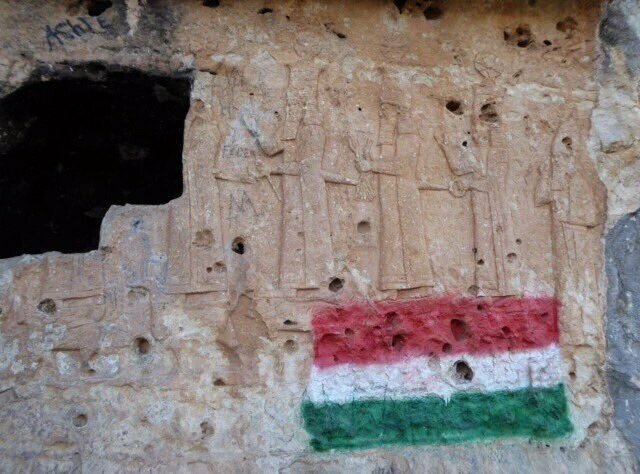 Since that is the case, a handful of Assyrians and non Assyriana criticizing the Kurds for doing this and the KRG for not protecting ancient sites is violent nationalism according to you but ACTUALLY vandalizing a side that’s 2400 years old ISN’T? Kurdish payrolls must be rolling out big $$ now a days. At least do a decent job at TRYING to be equally critical. Pathetic. You’ve entirely detracted from way has happened by downplaying spray painting a nationalist symbol on an ancient site that doesn’t belong to the government running it now. I do not work for Kurds and have never worked for Kurds. I have never worked in Iraq or even been to Iraq. I have not downplayed the vandalism. I have corrected misinformation and put the genuine bad news in proper perspective. Surely, you don’t think that it is unreasonable for me to distinguish between ignorant individuals who have painted a flag on a wall (which can be cleaned) and a genocidal terrorist organisation? The tone of your article is hostile, condescending, dismissive of Assyrians and their feelings. If you had no agenda or bias, you would have written an objective piece, just pointing out the errors (if any) without accusing Assyrians of “nationalism and bigotry.” But you did not, so your opinion and bias are revealed. Even if you are correct about the bullet holes, and you probably are, your inflammatory language has caused your message to be tuned out. As the saying goes, you can catch more flies with honey than with vinegar. I’m an atheist who documents destruction of cultural property and trafficking of antiquities. I have made a point of researching the genocide of Assyrians and showing how that genocide was financed by the theft and sale of Assyrians’ cultural property. What supposedly anti-Assyrian bias do I have? I did not accuse “Assyrians” of anything at all. I accused people who used “Gypsies” as an insult, and who called Kurds naturally destructive thieves who had no culture or history, of nationalism and bigotry. And let me make this clear that I am against the destruction of not only Assyria artifacts, but any historic, cultural artifacts. And the flag painted on the panel should be washed off, and if possible whoever did that should be brought to justice. And I assure you no Kurd is trying to “fabricate” a history of Kurds on the expense of Assyrians. I am from Erbil, and I am very proud of the city’s different civilizations including the Assyrian civilization which is probably the most important one of all the city has seen. We are proud of our own Kurdish history and culture, but we will never steal anyone’s history simply because we know it is not ours and we cannot boast of some sort of history or civilization which we know – and the rest of the world knows – is not ours. I have Assyrian friends and I love them. As a Kurd I am trying to understand them more, and learn more about them even though we live together in the same city, same community. found your blog when looking for information about Khanis and Maltai. I live in Iraqi Kurdistan myself and had the pleasure of visiting Khanis yesterday. Beautiful remains, if even very little. Hopefully I’ll get to visit one day. Hello, just chiming in from Duhok. Went hiking to see the reliefs this weekend with a group of local youth and some expat friends. It was my first time going there since last year – when there was no flag graffiti. As of yesterday (9Apr16), there are two Kurdish flags spraypainted (happy to provide pics). The good news about the vandalism is that most of it (most) is not on the carvings itself. So it might be possible to investigate graffiti removal. That said, it’s important to realize that the local Directorate of Antiquities (DoA) has done nothing to preserve this site or raise awareness about them and their historic importance. We’re going to see if we can talk to some motivated youth here, including those from our hike, to see if there might be a way to organize an awareness-raising and advocacy campaign focused on the need to protect and preserve sites like the reliefs.